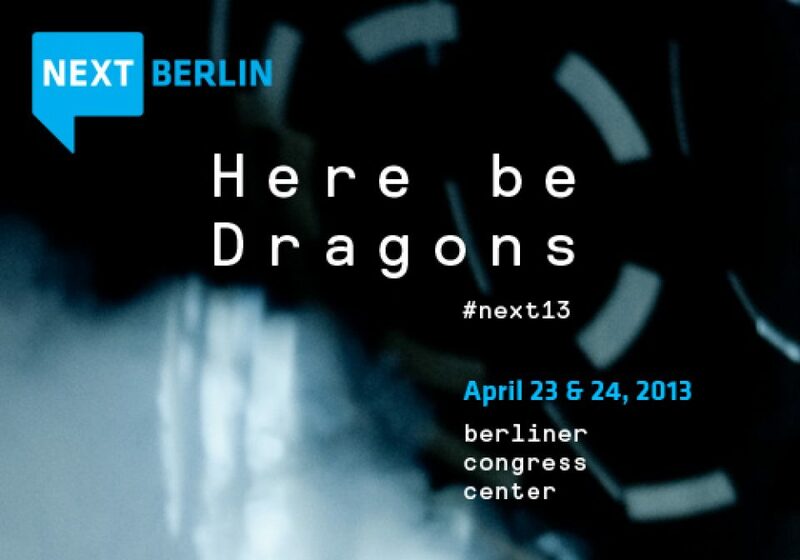 In line with the theme ‘Here be Dragons’ attendees of the digital trend conference NEXT Berlin (April 23 & 24) will explore new territories and face the challenges of our future. Malte Müller and Andreas Lexa did so, when they set up their design studio ‘We Are Fellows’ in 2011. One year later, they created the design concept for NEXT13. The first results of their creative work were published on the NEXT Berlin website and in printed ads. The designer’s main idea is based on the ‘Fog of War’ concept. In video games, unknown areas are often covered in fog. In the Middle Ages, the term ‘Here be Dragons’ was used to describe these areas on maps. The digital world still has a lot of these uncharted territories yet to be discovered. In an interview with PAGE magazine, Malte and Andreas explained the process of developing the basic idea into a whole concept for advertisements, the location branding and a trailer movie. “Everything was produced analogue in a photoshoot”, Malte and Andreas said. “There was no digital postproduction involved. Abstract elements like fog correspond with the interface elements and the results are really fascinating. They form the visual background to the subjects of the conference. The same effects were used in the trailer movie (Creative Direction: We Are Fellows, Director: Christian Straub). Dissolving fog is used as a symbol for the incredible amount of data or new technologies, which may blurr our vision now, but soon we will see clearly. How to slay the Dragons or gain vision, insight and perception? NEXT13 is the conference to tell you. Context expert Robert Scoble, Stephen Wolfram (inventor of Wolfram Alpha) and the digital chief of Obama's data-driven re-election campaign will inspire the audience at the Berliner Congress Center. On three stages and in numerous workshops more than 100 digital pioneers will share their knowledge with NEXT13 attendees. Around 2,000 participants are expected. These will include representatives of large corporations and agencies, business developers, marketing experts, technology wizards and creatives, as well as many start-ups, for whom Deutsche Telekom incubator hub:raum will provide a track, specifically dealing with their topics and pitches.